The western world was ruled from the city built on the legendary seven hills for 1,500 years. Rome was the stage for many historic events of worldwide significance during that era. After the collapse of the Roman Empire the city became the seat of the Catholic Church. 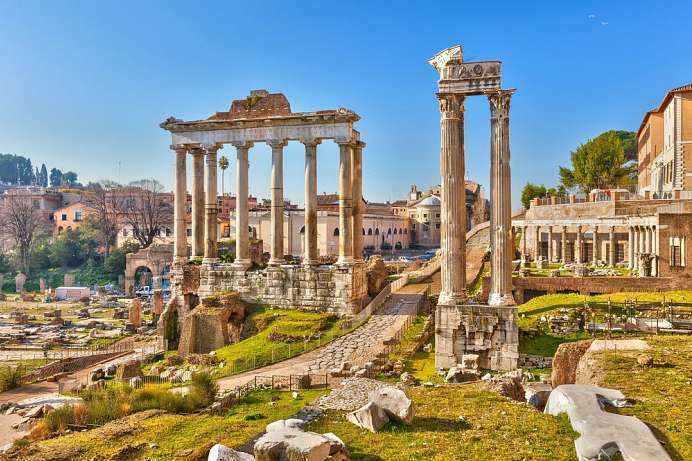 During the zenith of its power (the second century A.D.) Rome's population numbered more than a million, making it the world's first metropolis. However, only 25,000 people lived among the city's ruins at the close of the Roman Empire. Regrowth didn't begin until the return of the Pope from Avignon in the fifteenth century. 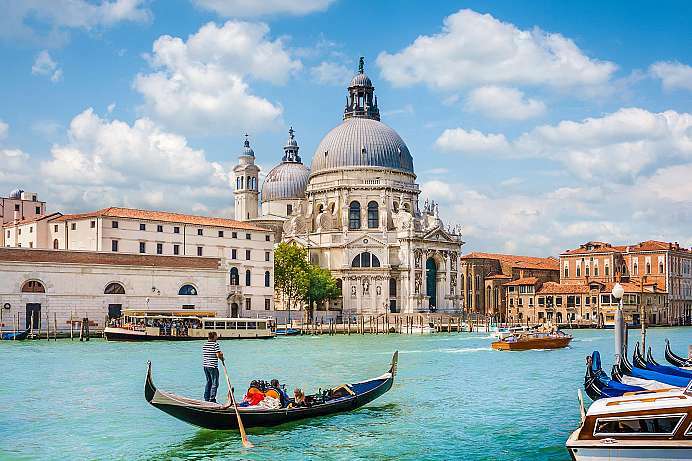 Today the Italian capital ranks amongst the premiere cities of Europe with regard to art, culture and a fast-paced lifestyle. 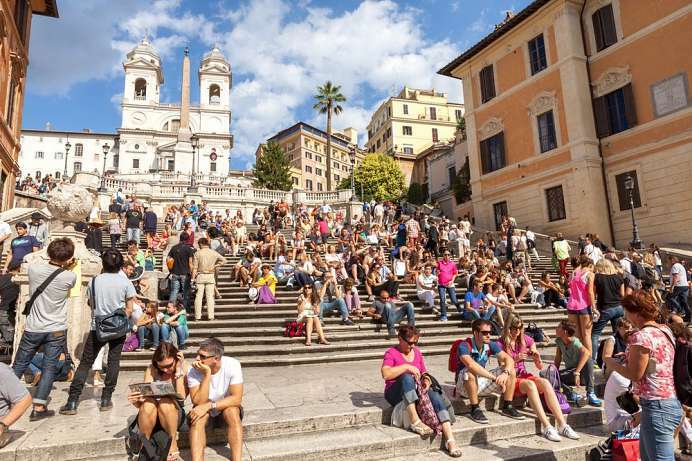 Millions of tourists visit Rome annually to take in the sights, shop and enjoy the cuisine. 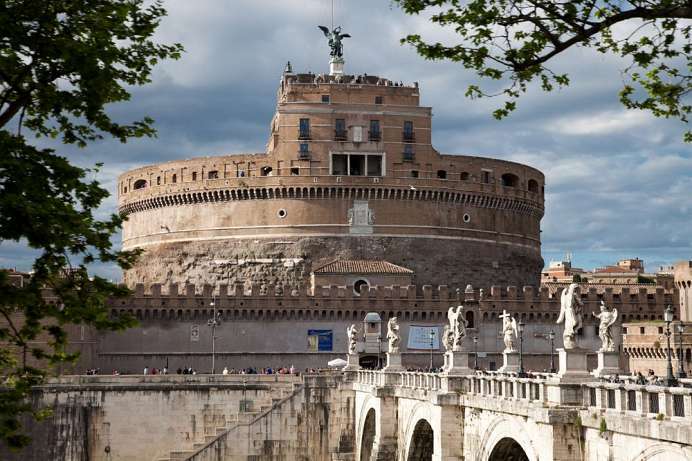 The circular fortress towers like a mighty colossus on the other side of the Tiber. Originally it was the monumental tomb of the emperor Hadrian, which was already completed in 139. Not only Hadrian, but also some later emperors, among them Mark Aurel and Septimius Severus, found their last resting place in the mausoleum. From the 10th century onwards, the Angel's Castle served the Popes as a shelter in the event of imminent danger, and later also as a prison. When the building fell into the hands of the Italian army in 1870 and was no longer under Vatican control, it was converted into a museum. To this day, various exhibits bear witness to the history of Rome. The castle received its name at the end of the 6th century: Pope Gregory I had prayed that God would free the city from the plague. Then the archangel Michael appeared on the roof of the castle and promised him the end of the plague. Until today the archangel stands there: widely visible as a bronze statue. 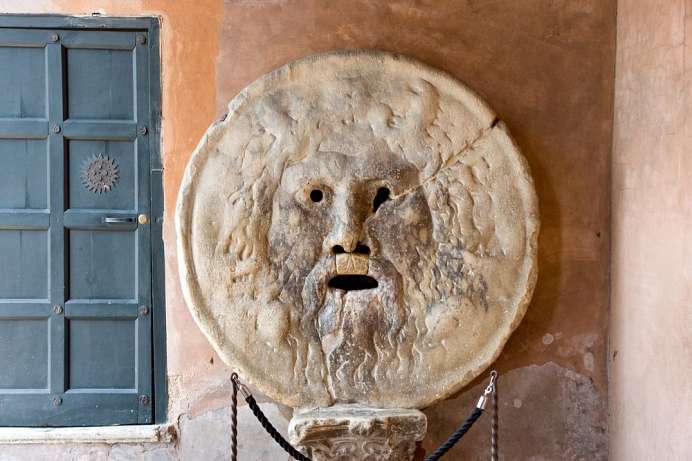 The “Mouth of Truth” is a marble slab of unknown age in the portico of the Church of Santa Maria in Cosmedin near the banks of the Tiber River. The face that adorns the disc has a hand-wide opening at the site of the mouth. In the Middle Ages the legend arose that the stone mouth closes as soon as you put your hand in it and lie – in other words a pre-modern lie detector. The mysterious mouth still fascinates its visitors today. Every day hundreds of people try to see if he doesn't bite. Often funny scenes take place. The “square of flowers” is not a stately piazza with representative buildings. But here you can wonderfully experience how Rome can captivate your senses. 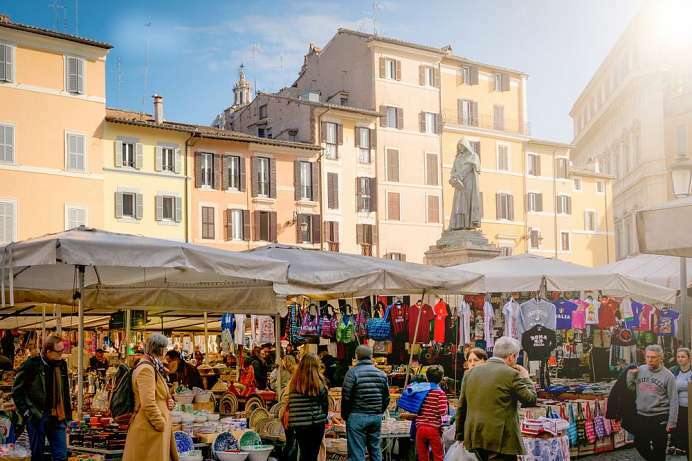 Every morning (except Sundays) market people set up colourful stalls – with vegetables, fruit, cheese, pasta, clothes, household goods and cheap Rome souvenirs. In the evenings, when the market stalls are closed, the strollers take over. Restaurants, cafés and bars invite you to linger and “watch the people”. Culture lovers are drawn to the Cinema Farnese, located on the south-east side of the square. The statue of Giordano Bruno recalls the poet, philosopher and astronomer accused by the Inquisition of heresy and magic. In the year 1600 his pyre burned on this campo. With a length of 600 metres, the Arena was the largest chariot race track in ancient Rome and probably the largest in the world. For centuries, the people of Rome experienced here “panem et circenses”, bread and games. The circuit was already built in the 6th century B.C. and was equipped with stone grandstands in 103 B.C. Up to 200 chariot races, gladiator fights and gigantic mass amusements took place here year after year; up to 250,000 people were seated on the grandstands. 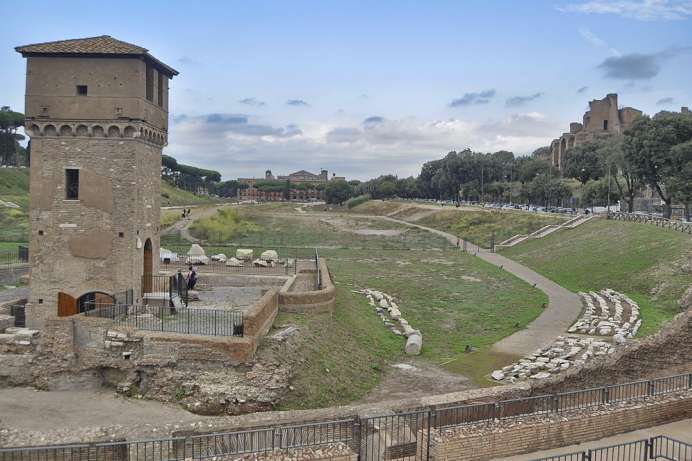 Today a lawn marks the ground plan of the original Circus Maximus: the remains of the spectator stands can be seen. The Colosseum, originally called Amphitheatrum Flavium, is the largest ancient amphitheatre in the world and a logistical masterpiece. It is also the archetype of all modern stadiums. It testifies to the outstanding architecture of the Romans, but also to the joy of cruel entertainment. 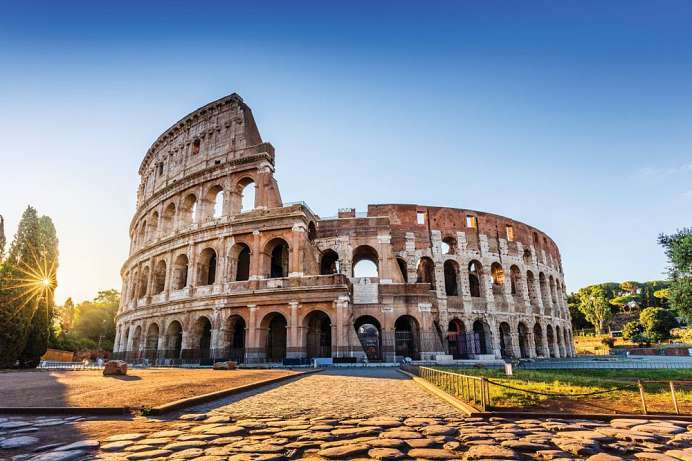 For example, the Colosseum in Rome was used for gladiator fights, animal rushes or simulated naval battles in which up to 50,000 spectators could enjoy themselves. The construction of the Colosseum began in 72 AD and was completed 8 years later, which is said to have been celebrated with a 100-day festival. Emperor Constantine finally ended the gladiatorial fights in 313. After that the Colosseum served as living space, as part of the city fortress or as a quarry for other buildings. The impressive rotunda with its columned façade was erected 25 B.C. as a temple for all gods and converted into a church over 600 years later. The dome is particularly impressive: it symbolizes the sky, the opening in the middle stands for the sun and the contact with the stars. With a diameter of 43 metres, the dome of the Pantheon was the largest in the world for 1700 years until St Peter's Basilica was built. Visitors to the Pantheon enjoy the meditative atmosphere inside and the delightful play of sunlight that falls through the openings in the roof and “wanders” along the floor. 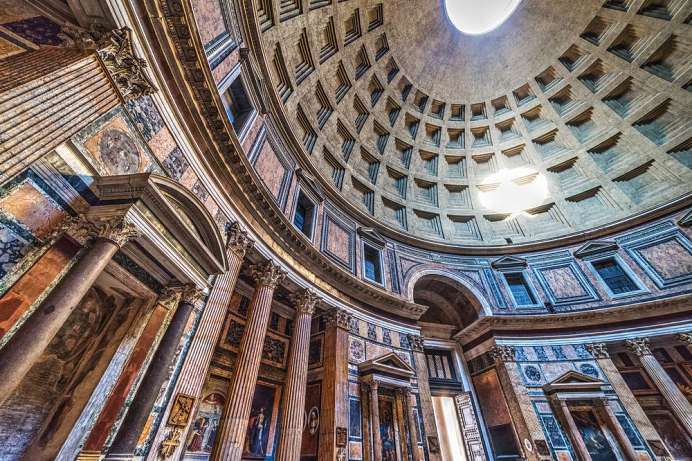 The Pantheon became the architectural model for domed buildings worldwide, such as the Capitol in Washington DC, the Berlin Cathedral or the Invalid Cathedral in Paris. A closer look at the huge square in the heart of the city reveals much about its origin: the long, almost oval surface resembles a track in the stadium. In fact, Piazza Navona was originally an arena. Emperor Domitian had it built. More than 30,000 people found a place here. In the Middle Ages the spectator stands were gradually converted into houses. In the 15th century, the stadium first became a park and then a square by paving. 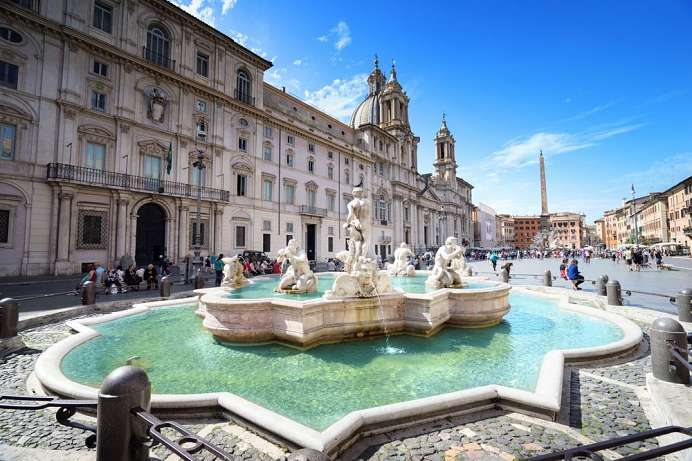 The most important monuments are the church of Sant Agnese, built in honour of the martyr Agnes, and the 17th-century four-stream fountain: On it four male sculptures symbolize the four continents known at that time in the form of the rivers Danube, Nile, Ganges and Río de la Plata. The unique debris field was the centre of the empire. Here beats the heart of ancient Rome. World history was written here. Today the Forum Romanum seems like a chaotic collection of ruins. 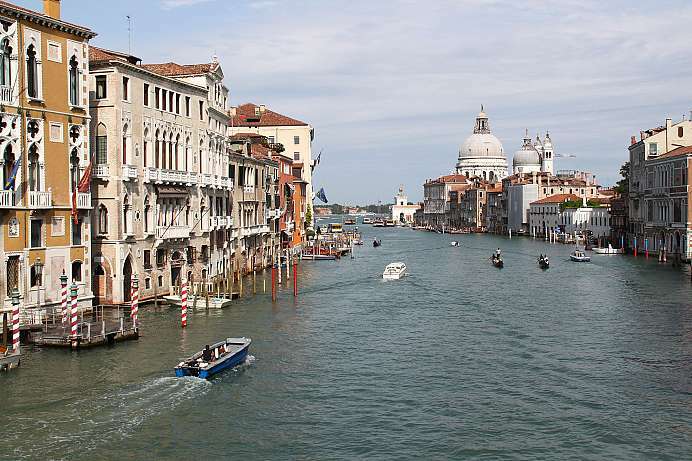 But if you look at historical drawings of the numerous buildings, temples, basilisks and triumphal arches that used to stand on this surface, you can get a good idea of city life. Besides the temples of Saturn and Janus, the Senate ruled the world in the Curia Iulia. Right next door, countless prisoners languished in the Carcer Tullianus for centuries. Of the three triumphal arches that the emperors had built to celebrate their victories, two are still preserved today: The Titus Arch was erected by Emperor Titus and glorifies the conquest and destruction of Jerusalem in 70 AD. The Septimius-Severus bow commemorates the important victory against the Parthians in the history of the world. The Basilica di San Pietro is the largest Christian basilica in the world and the central sanctuary of the Roman Catholic Church. 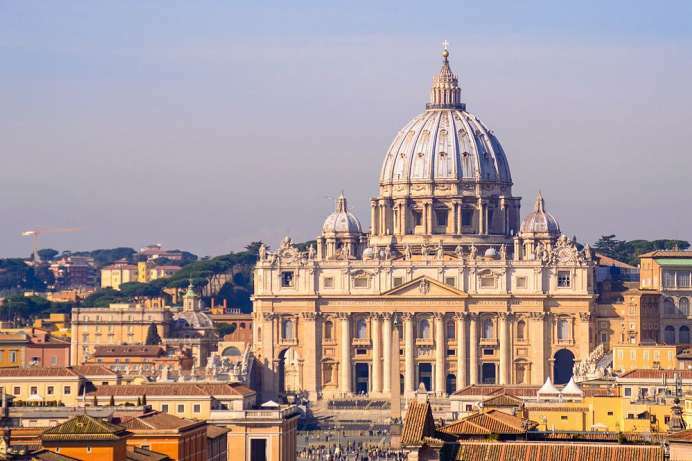 The monumental Renaissance building occupies about one fifth of Vatican City and is more than twice the size of Cologne Cathedral. It can accommodate up to 60,000 people. In the domed building there is the crypt with 23 papal tombs. Immediately below the main altar – at his presumed grave – St. Peter stands as a statue. Until today the pilgrims kiss the feet of the original apostle and eponym of the church according to old tradition. Those who climb the 537 steps to the dome of St. Peter's Cathedral will be rewarded with a great view across the Vatican and Rome. Villa Borghese is not a building, but a green area in the middle of Rome. It was built at the end of the 16th century on the vineyard of the Borghese noble family. In 1901 the state bought the estate and opened it to the public. Today there are numerous museums on the site, including the Galleria Borghese and the Museum of Etruscan Art. On the north side lies Bioparco, the Roman zoo with over 200 animal species. 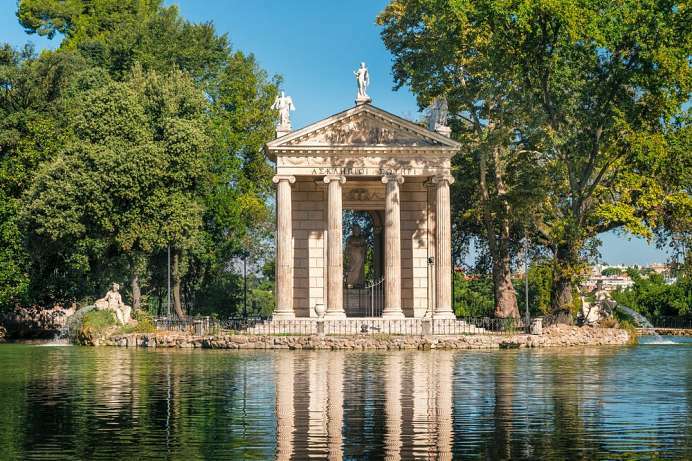 Villa Borghese is also a popular place for joggers and walkers; on a small lake you can rent rowing boats and watch the ducks. A beautiful place to rest after strenuous sightseeing.